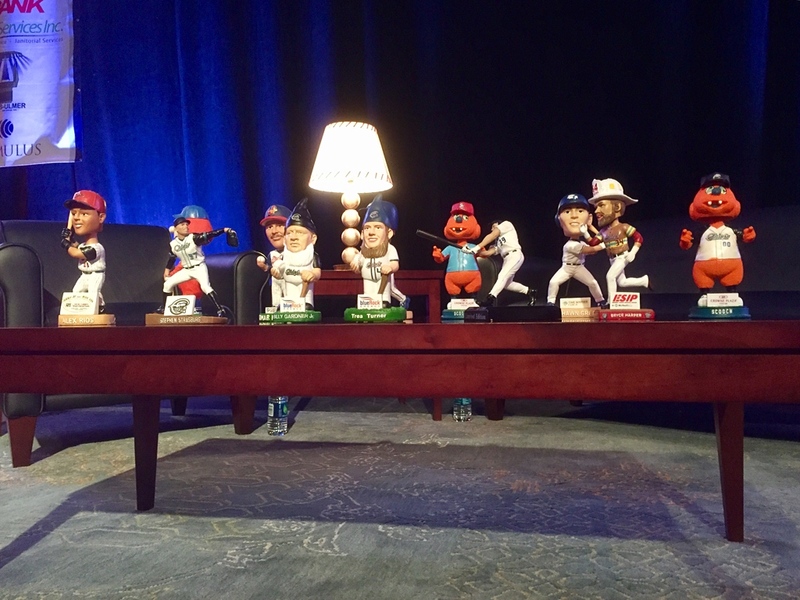 The Syracuse Chiefs Hot Stove Dinner warmed me up for the 2017 baseball season last Friday night. All dressed up, the Oncenter was. When my dear wife Karen asked me if I’d like her to say yes to two tickets offered to her at her job at Syracuse Media Group, I said yes in a flash. This baseball fan was ready for a winter’s helping. Even though I’ve lived in the Syracuse area since the summer of 1983 and have attended maybe 100 Triple-A games in first Big Mac and then MacArthur Stadium’s replacement park named after a series of sponsor financial institutions (Now NBT Bank Stadium) this was my first Syracuse Chiefs Hot Stove Dinner. The main room in the Oncenter downtown was all decked out. 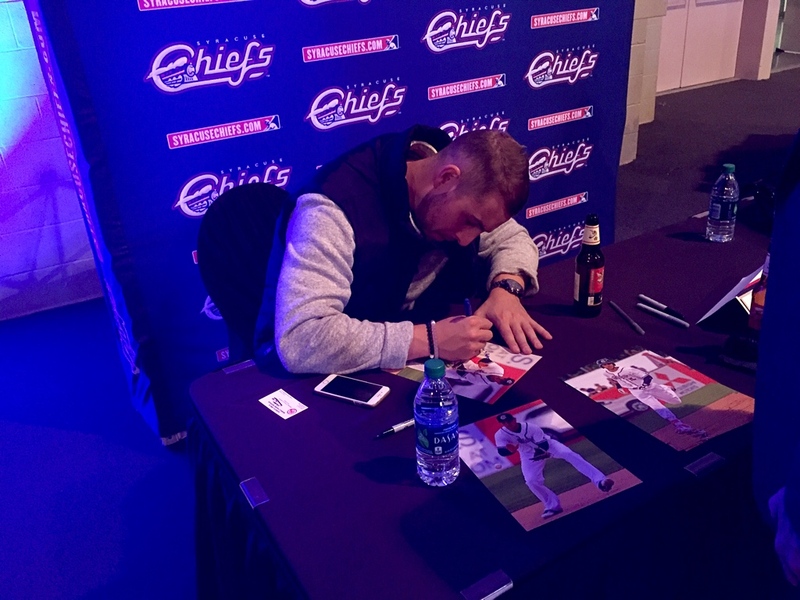 We wandered about, taking in the sights, including Chiefs first baseman Matt Skole signing photos. I remember getting a good picture of him smacking a homer myself. The folks from SMG at our table were friendly. 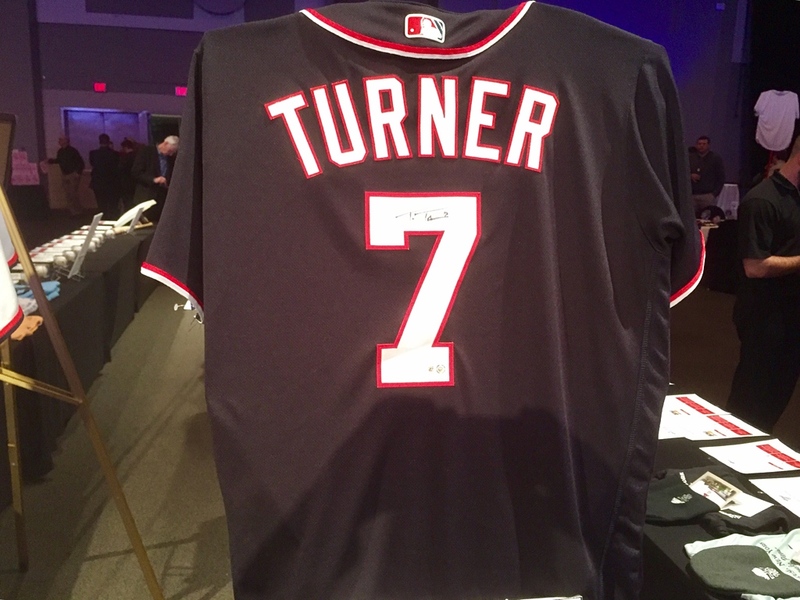 Star-to-be Trea Turner’s signed jersey. 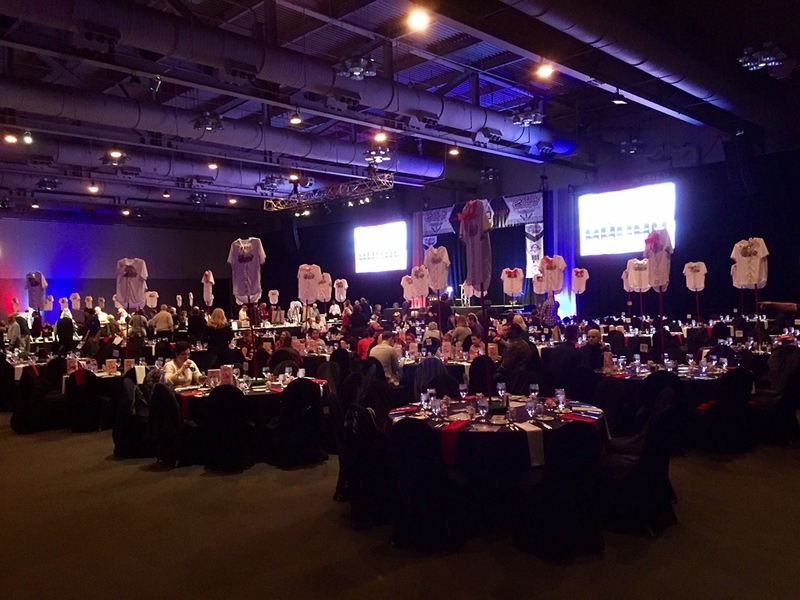 The silent auction was stocked with cool items, with the money from successful bids going to the Chiefs’ charitable foundation. I bid on two. My first offer, for a shirt and hat and $50 certificate for Twin Trees Too pizza, got topped early, and I did not follow up. But when my iPhone 6s chimed that my bid for GM for a Day, a certificate good to shadow the Chiefs’ honcho Jason Smorol, was no longer No. 1, I went higher. I wanted to win it for wonderful daughter Elisabeth’s terrific significant George Three, the biggest Chiefs’ fan I know. In fact, I upped my bid several times. But a minute before the 7:30 closing time, somebody beat me by five bucks. Sorry, George. Louisiana Lightin’ was in the house. Dinner was good, salad and chicken with potatoes and veggies. 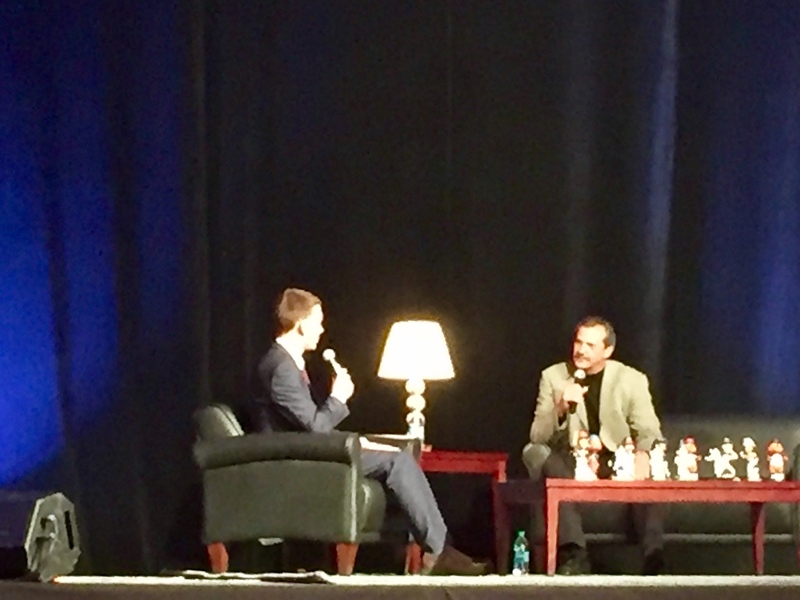 We also got to hear a on-stage chat with the guest of honor, former Yankees great Ron Guidry, who in 1975 pitched for our Syracuse Chiefs. Winner, winner, after chicken dinner. 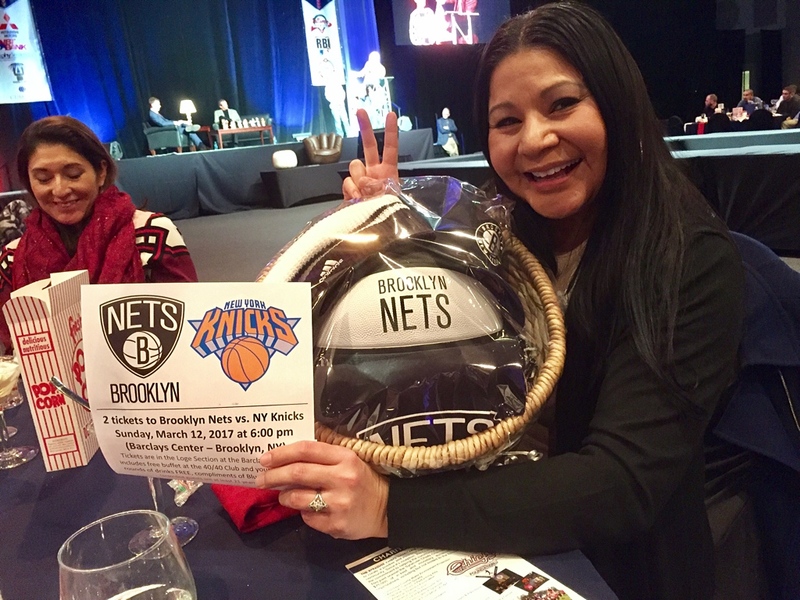 And our table mates won some stuff with their bids, including Lea, who took home a Brooklyn Nets package that includes game tickets. Nice! Me? I’m looking forward to the first trip to the stadium this year. I need a trip to the stadium, Mr. McKeever. that sounds like a great night, all around. i’ve never won anything in auction except for a pair of cowboy pajamas and when i won those i had to laugh, looking at how much i ended up paying for them but the game was in the bidding. i’d say your bidding approach was well-played. I hope you put on those PJs and let out a Yee-Ha! Beth. After winning the bid, and all. Ha!